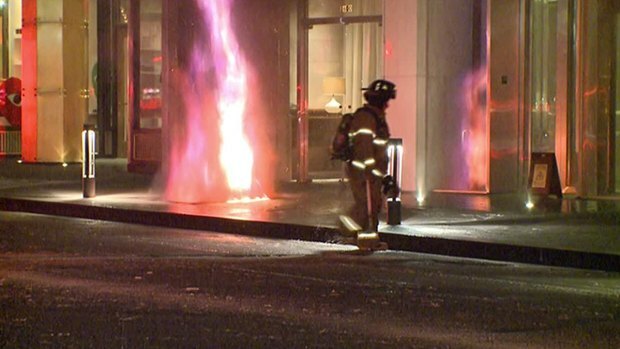 Dallas firefighters battled a fire that erupted through the grate of a sidewalk in front of the Joule Hotel on Main Street in Downtown Dallas Friday morning. More than 50 firefighters got the call about a fire in the 1600 block of Main Street just after 3 a.m. According to the Dallas Fire Department, the sidewalk access point to an underground electrical vault caught fire, sending flames shooting 10-15 feet into the air above the sidewalk. Firefighters took a defensive stance until power was shut off, then they moved in to put the flames out. Firefighters were called to the 1600 block of Main Street in Downtown Dallas for a fire under the sidewalk near the Joule Hotel. Oncor Electric Delivery told NBC 5 power was cut to a five block area of Downtown Dallas because of the fire. The outage included Dallas City Hall, which is operating on backup generators. Once the electric vault was de-energized, firefighters planned to put out any remaining flames.No one was injured by the fire. As a precaution, the fire chief at the scene said 80 people were evacuated from the Joule Hotel and moved to nearby Magnolia Hotel. Several blocks in the area are closed down as firefighters work to contain the fire. Power was restored to the hotel before 10 a.m.
"There was a brief electrical fire under the sidewalk in front of The Joule Hotel this morning. Very little damage was done to the hotel, but as a safety precaution hotel guests were temporarily moved to the neighboring Magnolia Hotel. The Joule Hotel's normal electrical power has been restored. As a result of the fire, the restaurant CBD Provisions incurred minor glass and smoke damage to its exterior; and the restaurant will be briefly closed for cleaning and repairs. We appreciate the quick response and efforts of Dallas Fire & Rescue and Oncor, as well as the support of The Magnolia Hotel,” said Michael Tregoning, chief financial officer, Headington Companies, in a statement Friday. For much of the morning, fire crews were on hand to make sure there wasn't any structural damage to nearby buildings. NBC 5's Ray Villeda and Shane Allen contributed to this report.